ONLY $29.99 per month subscription ! 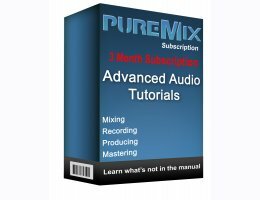 A lot of time and effort has gone into producing great instructional videos and session templates that reveal how audio professionals get their recordings sounding just the way they want them to. Fab and Ben share their extensive experience in a very well thought manner and explain to you the technical methods that take your work to the next level of professionalism. They've thought about all the issues they had to deal with over the years honing their skills. And they came up with targeted answers to those all questions. Puremix has thought of a way to organize all that knowledge in a format that delivers lots of important information in the shortest amount of time with the minimal of waste. The online's content is produced in professional studios with the highest attention to detail coupled with their relentless curiosity and tender loving care for all those things they cherish about music and sound.